As with most endeavours, ours too was borne more out of frustration with the existing state of things than anything else. 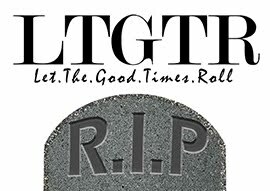 LTGTR was literally created to “Let The Good Times Roll”. I still remember that afternoon; me, Kartheik and Rajat were all fed up with the college and were bitching how no one took our opinions into the decision making process. And we decided we would change that! The fist LTGTR was a 10 page newsletter which we pasted on the doors of our mess. It was funny, sarcastic and most importantly an instant success. Okay maybe success is too big a word, but it certainly caught the imagination of the people. And ruffled quite a few feathers as well. It was followed by two more issues in the space of a month which focussed mostly on campus centric stuff. It was too good to last and it died out. And I honestly thought it was the end. In the same summer of 2010, Kartheik suggested we start it again. We decided we would make it bigger, include more people and make it a lil more generic. The first issue was released in August 2010. The original idea was to have a separate LTGTR in every college in India. Yea we got caught up in our youth and idealism. Then we finally consolidated the idea to being a youth centric magazine without respect to any college or campus. But while we finally decided upon this, we had already reached December 2010 and hence you see some campus centric stuff in our earlier issues. 2. 2. We’ve received praise and encouragement from a lot of people who we don’t even personally know. It’s not all rosy. LTGTR is certainly a work in progress. We’re nowhere close to what I had wanted it to become; a medium where the youth of this country connected and discussed various issues and tried to find solutions. We have fallen short of our target of readers by a long, long way. We should have put up a website a long time back, thankfully that has been corrected now. Like I said, compared to my vision for LTGTR, what we have now is like a tiny speck on the canvas. But in many ways that’s the beauty of LTGTR. I can have a vision for it and so can you. Neither is wrong, neither more strong. LTGTR is not supposed to my magazine, or that of the other people who help make it. It is supposed to truly be a PEOPLE’s magazine. And one day hopefully we shall reach there. It has been a long and often strenuous journey. While I hoped that it would become a household name, it didn’t believe that it would outlive the year. And there many times where I personally just wanted to shut it down and get on with my studies and personal life. And at this point I cannot thank one person enough, Vakul Mohanty. He has been an absolute rock at times. I remember there were a few issues where it was just the two of us working. It was hard work but we pulled through. Also at this point I cannot but thank Sayonee Ghosh Roy for her help. I wouldn’t know half my current team if not for her. I’d also like to thank all the other people who I work with Nishant, Vijay, Vidya, Rachina, Kartheik, SuryaTej, Sukanya, Pradeep. I’m sure I’ve missed a few names. My apologies and no offense intended. And finally I’d like to thank the hundreds and maybe thousands of you readers who have been with us till now. Life comes full circle for us with this issue. And from the next issue we try and begin afresh with a wider range of content, hopefully with more humour and information than now. You can expect to see more innovative columns and some really weird stuff :P. Apart from that, we are also pleased to present our website www.ltgtr.in where you can find all our previous issues and news about what we’ll be doing. We’re adding more and more features everyday so keep checking it out regularly. Also planned is a concerted strategy to reach out to more and more people and not just reach out but also involve them in the making of the magazine to try and reflect the diversity of human thought. As with everything that begins fresh, we do not know if we shall outlive this year either. And hence we could do with all the encouragement and help we could get it. If you don’t like something please criticize. You have no idea how highly we value your criticism. If you disagree with what has been published then please comment. And if you like the magazine, please share it with your friends, family and just random people J. Finally I shall conclude by saying that our commitment to providing you an incredibly good read has never been stronger. We’re still dedicated to keeping the good times rolling.